Turns your shoes into slip-ons with blue no tie elastic flat shoelaces. Unless you enjoy tying your shoes, you sacrifice nothing with blue no tie elastic flat shoelaces: not comfort, security, or style. With its 130% stretch combined with a secure hold you'll experience the same exact level of comfort every time you put your shoes on. All it takes is lacing up your shoes that first time, and then you'll have instantly turned your shoes into slip-ons. Easily laced and ready to wear. Just because these are the most convenient laces you'll ever own doesn't mean they take any special effort to lace. 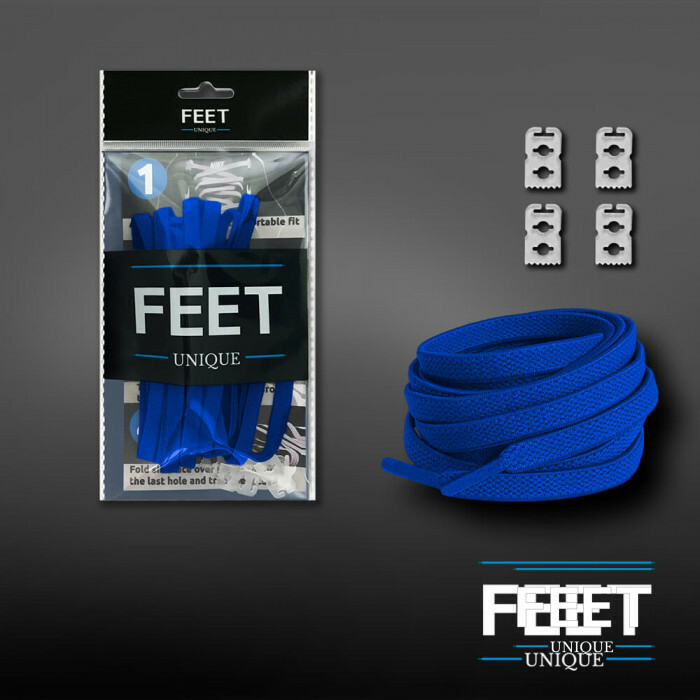 Just like you would slide in normal laces, simply thread through your blue no tie elastic flat shoelaces, tighten them to your perfection, , insert the included locks clips and trim the excess lace. Now you're good to go. Universal fit perfect for every foot and type of shoe. Are these laces for you? For someone you love? For the whole family? You can buy with confidence knowing that one size fits all footwear (except for tall boots). You barely have to bend down – simply slide your foot into your shoe and head through the door. The fabric of these no tie laces give off a smooth, sleek shine that makes the blue color impossible to miss. Match them with shoes of a similar blue to mute the effect, or lace them into a pair of white sneakers for a bold pair of shoes. The choice is yours, and with so many other colors to choose from, you can really get creative by mixing things up. SATISFACTION GUARANTEE – We offer a 100% Satisfaction Guarantee. If you don’t like the shoelaces, we’ll give you a quick and courteous refund – No need to refund the laces.